The Smithsonian Institution organized the project with the aid of the U.S. Committee of the Blue Shield. The Smithsonian signed formal Memoranda of Understanding with the Haitian government through the Presidential Commission for National Reconstruction and through the Ministry of Culture and Communication to implement the project. The U.S. President’s Committee for the Arts and the Humanities mobilized U.S. federal cultural agencies, which are providing grant funds to the American Institute for Conservation, to support qualified, volunteer conservators to work in Haiti. The Broadway League provided a major gift to start the project. Agreements with UNESCO, the International Committee for the Blue Shield and consultation with the U.S. State Department assure close cooperation with other international efforts in Haiti. Other sponsors, like the Affirmation Arts Fund, have also come foward. 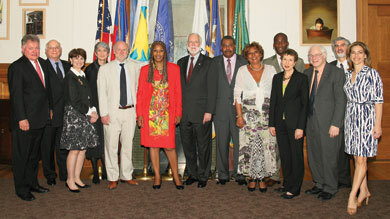 Meeting of Haitian and U.S. cultural leaders in Washington, D.C. on May 5, 2010, to discuss the Haitian Cultural Recover Project. (from left to right) Bob Wankel, President and Co-CEO of the Shubert Organization; Paul Libin, Chairman of The Broadway League and VP/Managing Producer of Jujamcyn Theatres; Margo Lion, Co-Chairman, President’s Committee on the Arts and the Humanities; Nina Lannan, Immediate Past Chairman of The Broadway League; Rocco Landesman, Chairman, National Endowment for the Arts; Marie Laurence Jocelyn-Lassègue, Minister of Culture and Communication, Government of the Republic of Haiti; G. Wayne Clough, Secretary, Smithsonian Institution; Patrick Delatour, Minister of Tourism and Chair, Presidential Commission for National Reconstruction, Government of the Republic of Haiti; Francoise Thybulle, Director, National Library of Haiti; Frantz Toussaint; Marsha Semmel, Acting Director, Institute of Museum and Library Services; Jim Leach, Chairman National Endowment for the Humanities; Richard Kurin, Under Secretary for History, Art and Culture, Smithsonian Institution; Rachel Goslins, Executive Director, President’s Committee on the Arts and the Humanities. 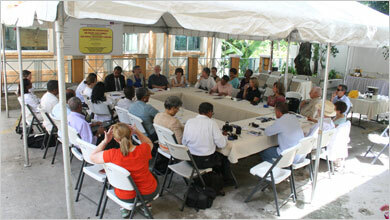 Members of the U.S. President’s Committee for the Arts and the Humanities visit the Haitian Cultural Recovery Center July 8, 2010. They are joined by representatives of the Haitian government and Haitian non-governmental cultural organizations to discuss the project.